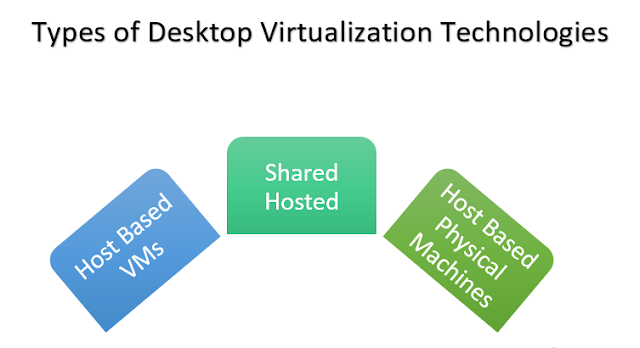 Home » Uncategories » What is Desktop Virtualization? Desktop Virtualization is the concept of isolating a logical OS instance from client that is used to access it. Not all the forms of desktop virtualization used VMs. 1. Host Based VMs = In this each users connects to the individual VM hosted in the datacenter at 1:1 ratio. They may get the same desktop every time in case of persistent or dedicated desktop or they may get different desktop in case of non-persistent or floating desktop. 2. Shared Hosted = Users connect to a shared desktop that runs on a server. Microsoft RDS based desktops are the example of this shared hosted. 3. Host Based Physical Machines = OS runs on another device physical hardware. 0 Response to "What is Desktop Virtualization?"